I have been enthralled with my ancestor Stephen Bennett since I first got started in Genealogy. I can still remember the day like it was yesterday. I drove to MTSU to do some research on my family. Not sure what made me decide to start doing Genealogy that day, but I was home visiting and decided to go and see what they had Genealogy wise and while I was there I found out that Stephen Bennett was my 2nd great grandfather and that his body had been stolen from the grave! Photo of Stephen Bennett shared by Stephen Ray on Findagrave.comI immediately got directions to the cemetery and drove to it. As I sat there in front of the grave of Stephen and his wife Sarah and his mother and father, Elizabeth Manier and Drury Bennett, I felt as if I had come home. https://rutherfordcemetery.wordpress.com/2009/01/11/6-bennett-cemetery/When I got home with my new findings, so excited that I was now a Genealogist, my dad said, “Your grandmother told that story every Halloween. I thought you knew that.” Now I have no recollection of my grandmother EVER telling this story, yet my older cousins have confirmed she told them. Since I grew up on the family farm, and my grandparents, whom lived 1/4 mile away, were for many years our nearest neighbors, how had I never heard this story? Well, for one, I am younger than my cousins. They were teenagers or almost when I was born. My grandmother was born in 1902. By the time I came along, she was in her sixties. By the time I was 13, she was gone. If she told the story, I was too busy to stop playing with my many cousins to listen to the ramblings of an old woman. And so somewhere along the way, I had missed out on hearing the story. However, I had not missed out on visiting old houses and visiting older family members. Sometime in the early 70s we visited an older farmhouse that was being torn down and a newer house was being built. I am pretty sure it was someone in my grandmother’s side of the family, since she knew the house well. If it wasn’t the same house we visited, it was the same floor plan! I was thrilled to see Drury’s old home. Stephen Bennett died on 01 Jan 1898. A few days later, his body was stolen from the grave and was sent to Burlington, VT in a box marked “books.” The local doctor, C. B. Heimark was found guilty of the crime. There were two women whose bodies were also stolen that week and they two were returned to TN for reburial. 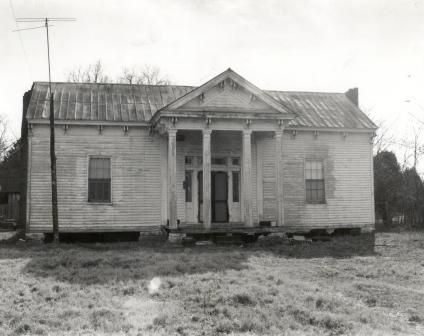 The trial was held in Nashville, because Heimark had asked for a change of venue. He feared the mobs that had formed in the court yard outside the Court in Eagleville and had asked to be moved to Nashville. 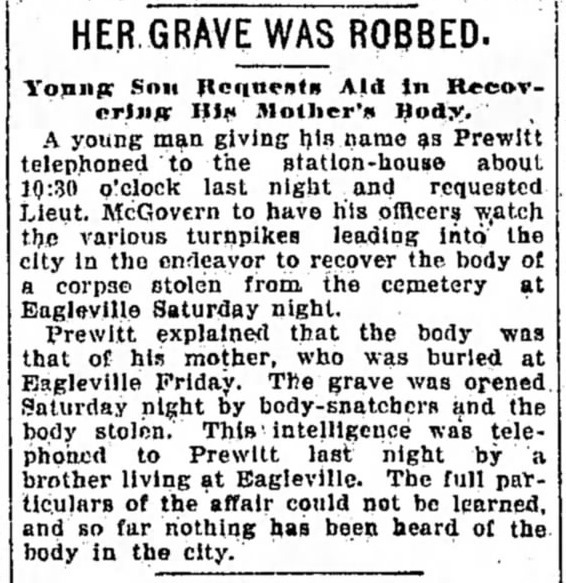 Prewitt Grave Robbed (from The Nashville American, 17 JAN 1898, page 4 column 6)The first story to be printed was that of the grave robbing of Mrs. Prewitt. Her son had called police to let him know that he had heard from his brother in Eagleville that his mother’s grave had been robbed. This small excerpt in the middle of the page in the Nashville American would be the first mention of the grave robbings. It was buried in the middle of the page, yet it would raise a great fervor not only in the Eagleville community, but among the grave robbers themselves! The next day, Mrs. Mary Prewitt’s body was found! But here is where the story gets even weirder. People who had recently lost loved ones went out and began to dig their relatives up to see if their bodies have been stolen! Can you even imagine saying to your spouse, “Honey, today I think I’ll go out and dig up your daddy because there’ve been grave robbers in the area.” How do you even start that conversation. In Stephen’s case, the family has stated his grave looked sunken in and that was what made them decide to check it out. Mrs. Mary Prewitt’s body had made it all the way to a medical school in Nashville, and when the faculty read the newspaper clipping from the day before, they panicked and sent someone to get rid of the body. Notice no effort was made to return her to her family. Instead she was dropped in the bushes along the road! Nice try guys, but no family member is going to be appreciative of Momma being dropped by the side of the road. Especially naked and wrapped in an old bag. Why naked? Well, you see, stealing the body was a misdemeanor. But stealing clothes, based on value, could get you a felony charge. So yup, they had to stand there by the grave and undress this poor woman and leave her clothes behind. So they took the body, wrapped it up and drove it through Nashville in broad daylight, where they dumped it on the side of the road. There a black woman saw the strange buggy drive by her house and having been alerted to be on the lookout for strange buggies in the area, reported it to the police! Way to go for her. She was probably the very first Neighborhood Watch and her recollections helped blow this case wide open! Once she was reinterred, the family stood watch for several days. My dad said when he was a young child, they would park several wagons around the grave with lanterns hanging from the grave. If the lanterns moved, it would alert people in nearby houses that the grave was being bothered and of course, they came out guns at ready! He also stated they would lay match sticks on the grave and if they moved, they knew the grave had been bothered. I can not imagine the distress this must have put an entire community in to know that they had a grave robber in their midst! Now after Mrs. Prewitt was found, the case went to finding Mr. Bennett and Mrs. Corbett. Several medical schools in the area were searched: the University of Nashville, Vanderbilt and the University of Tennessee. The bodies were not found, but those of several Negros were found. I think its sort of sad that no one bothered to investigate whether these bodies had been obtained legally or not. They weren’t the bodies we were looking for so we will just ignore them. Sad, but that’s pretty much how it works in life. We now have the names of three of the individuals that were stolen: Mary Prewitt, Eva Corbett, and Stephen Bennett. A fourth unknown black woman has also been found to be missing. Mrs. Prewitt’s body has been returned but two days after the call went out she was missing, still hasn’t been reburied. Ten days are passed and we finally have a name of three of the perpetrators: Dr. Heimark, the local doctor, a Mr. Satterfield and a Mr. McGowan. McGowan is being questioned about his role in the grave robbing. Jeda McGowan was the black assistant of Mr. Heimark. He apparently purchased sacks from a Mr. Satterfield. Satterfied was a janitor at the University of Nashville. We see here in the trial against Jeda McGowan, that he is refusing to cooperate and testify as to his involvement and is being held in Contempt of Court. The judgement was reverse and Satterfield was discharged. It must have been an amazingly wonderful day for the families of Stephen Bennett and Mrs. Jane (Eva) Corbett when their bodies were recovered and brought back home! And now we have another name. Mr. H. R. Watkins. Mr. Watkins had received the bodies in Burlington, VT, where they were destined to a medical school to be a cadaver. The reason for so many grave robbings in the early 18th century was that medical schools were popping up like mushrooms around the country. These medical schools needed bodies to train their doctors in surgery, to learn about sickness, etc. There just weren’t enough bodies to go around, so they began to pay people to collect them for the schools. Apparently in 1898 the going rate was $15, because that is what Dr. Heimark was paid to retrieve the body from the grave. Being the local doctor, who knew who had recently died and what they had died from. I imagine that made his cadavers very wanted by the medical schools in question. More on the crime is now coming to light. 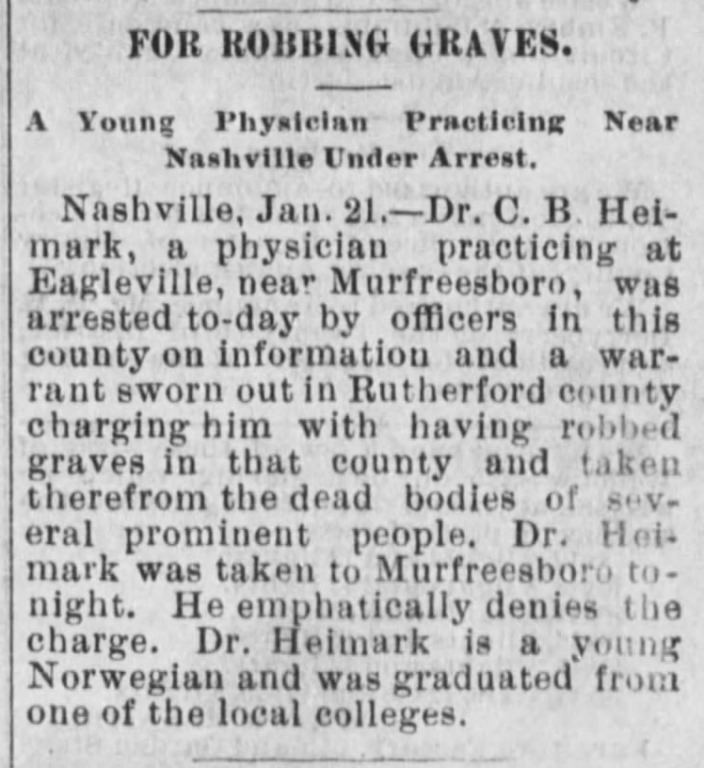 Heimark stole the bodies from the cemetery and sold them for $15 to an unnamed person in the city (Nashville). It is unclear here if he got $5 per body for $15 total or $15 per body. It appears it was $5 per body. Imagine your father has recently died and you’ve buried him and then you discover someone took his body and sold it for $5! I know I would be angry. The unknown person then sold them to a third person for $20 and this third person sold them to a fourth person, whom shipped them to Burlington, VT. on January 18th. He was paid $55 for each body! Mr. Watkins received the bodies in Burlington, VT. He then received a telegram from Mr. Unknown #4, the shipper to “Ship two bodies back which were sent you last Tuesday, immediately.” At this point, police are keeping the identity of Mr. Unknown #4 hidden from the public. I am sure they realize that he ships bodies regularly to medical hospitals and he is going to become a very valuable informant. Mr. Hanifin, the Nashville police officer on the case receives a receipt for the money sent by a J. G. Porter for $110. The bodies are returned to their families. Stephen Bennett Jr. has to go to the police station and identify his father’s remains. His father has now been dead for 26 days! Can you even imagine what that must have been like for these families? It had to be too much for even a police officer. Stephen Jr. was 40 years old when his father died, but I am sure nothing in life prepares you for this. So you may ask, if Medical schools in VT needed cadavers, why not steal bodies there, instead of TN and then shipping them? Well, in TN, the penalty for stealing a body in 1898 was a misdemeanor. But in VT, it was punishable with imprisonment for ten years. I’d pay to ship a few unknowns from TN too, wouldn’t you? Mr. Unknown, #4, the shipper, was looking at a charge of shipping a dead body out of State unlawfully, which calls for a penalty of from one to five years in the penitentiary for each case! In other words, he could get up to ten years for just shipping these two bodies! And I am sure there was evidence this wasn’t his first rodeo as we say in the Deed South. Then we learn that between 70-100 bodies each MONTH were being shipped from Nashville, TN to medical schools in the late 17th century! Makes me wonder how many of my ancestors final resting places were as cadaver’s in Medical Schools and not the family graveyards where their tombstone lies. Heimark Arrested (from Weekly Columbia Herald, 28-JAN-1898, page 1, column 6)Finally the day the families must have been waiting anxiously on had arrived. Dr. C. B. Heimark was arrested. Of course, he denies that he was involved in the crime. Stay tuned, because this is only the first part of this intriguing story. There is far more! Previous Post Do You Ever Wonder? The things I learn doing genealogy. Amen to chmjr2! The things I learn doing genealogy! Hi! Great story!! I guess we are cousins? Stephen Bennett is my great great Grandfather. He had a daughter Fiona. She had my grandfather Warren Gillespie. Watren had a daughter Elizabeth (my mom). Melinda! Hey cousin! I am so excited to meet someone from another branch. My line is from Fiona’s brother William Tilford Bennett who married Mary Etta Carlton, to his daughter Era who lived in Nashville. I would love to share some family photos if you have some of your side. I have none of Stephen and Sarah Catherine. I found a photo! I’ll keep looking!